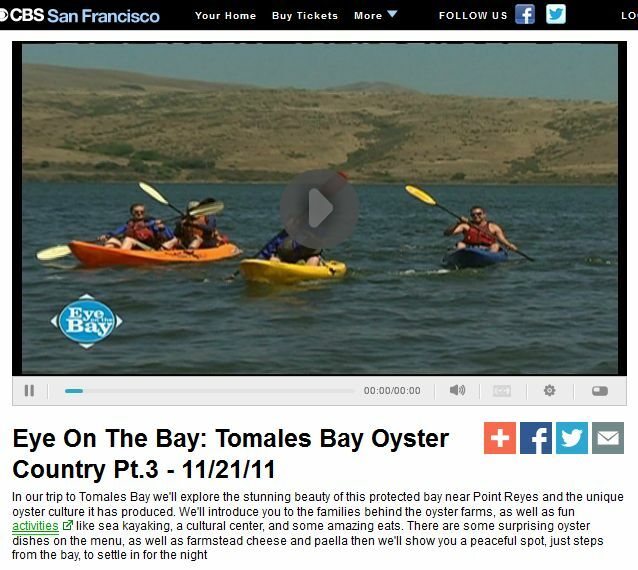 Watch as CBS San Francisco’s Eye on the Bay Series visits Tomales Bay and Blue Waters Kayaking! On our trip to Tomales Bay we’ll explore the stunning beauty of this protected bay near Point Reyes and the unique oyster culture it has produced. We’ll introduce you to the families behind the oyster farms, as well as fun activities like sea kayaking, a cultural center, and some amazing eats. There are some surprising oyster dishes on the menu, as well as farmstead cheese and paella then we’ll show you a peaceful spot, just steps from the bay, to settle in for the night. Click Here to go to CBS.com and watch now!